It might be cold outside now but the the seed buying season is in full swing!!!! It's getting crazy! And, growing season is just around the corner because growing season starts in February when we will get our cabbage and cauliflower seeds started!!! Here's what we have in store for this year! Pictures and descriptions provided by Burpee and Dixsondale Farms. If you like hot peppers like we do you're going to love our selections. We have most of your common hot peppers and a few that might surprise you. Luscious, green, low-heat 3" hot pepper reminds us what how utterly delectable a pepper can be when your mouth isn’t on fire. 'Born to be Mild' provides full spectrum of flavorful nuances that, with hotter varieties, go up in flames. Born to be Mild’s flavor is earthy, rich and full-bodied: a welcome addition to a stir-fry, or enjoyed roasted. Believed to be the hottest pepper in the world, the Carolina Reaper is a serious scorcher! For those extreme pepper eaters, Carolina Reaper is a must. For those less adventurous, they make a great conversation piece in the garden. These devious little peppers are fiery red with a little scythe shaped tail at the base of many fruit, hence the name reaper. The heat rating on these monsters can be over 1,500,000 Scovilles; in comparison the spicy habanero is a mere 100,000 Scovilles! Whimsical green and red Scotch Bonnets bring fun to the kitchen. You won’t have to fall down a rabbit hole to bring the ‘Mad Hatter’ to your kitchen! Whimsical green and red peppers resembling hats bring fun to kitchen. Peppers are sweet, crisp and crunchy with a subtle floral scent. Flavors intensify as fruit ripens. Your family will be mad for this pepper! Also known as Ghost Pepper, Naga Morich. Legendary variety, one of the world's hottest peppers, with readings in excess of 1,000,000 Scoville units! Bhut Jolokia starts out slow but eventually makes tall plants, exceeding 4 ft in favored locations. The thin-walled, wrinkled, pointed fruits reach 2-3" in length, ripening mostly to red. Cook's Garden Favorite. Hot, hot, hot! Sizzling, pungent 3 - 4" pepper guarantees this is going to be one hot summer. Five times hotter than jalapeño, fire-breathing ‘Dragon’ adds flame and flavor to Mexican and Asian dishes. This pepper runs rings around other jalapeños! Let ‘Ring Leader’ be your summer-long source for tasty jalapeño rings in Southwest recipes and salads, and on burgers and tacos. Fantastic stuffed or pickled too. Dark green, medium-hot, thick-walled peppers 3" long, 1" wide, with rounded tips. This is the pungent little dark green pepper found in rings atop nachos and chopped in Mexican sauces -- both sweet and hot, with an addictive flavor that has made it one of the most popular seasonings in American dishes! Mildly pungent, 4" heart-shaped fruits that ripen from dark green to deep red. Called Ancho when dried, Poblano when fresh. This is one of the most popular peppers grown in Mexico. Fully ripened, red fruits are much hotter and flavorful than the earlier picked green ones. Small, very hot peppers that lend the kick to the famous hot sauce. Originally from Mexico-and taking its name from a Mexican state-this small, very hot pepper's a favorite in the South and East. Best known as the pepper that lends the kick to the namesake hot sauce from Avery Island, Louisiana. The Serrono originated in the mountainous regions of the Mexican states of Puebla and Hidalgo. The name of the pepper is a reference to the mountains of these regions. Pick green Serranos for more mild flavor or wait until they're mature and "red hot", at about 10,000 Scovilles. One of the hottest of all peppers. Habanero means 'from Havana'. Habanero and its kin long ago migrated from the Caribbean Islands to Central America where they remain extremely popular today. A close relative of the Jamaican Scotch Bonnet. To complement its searing heat, Habanero has a delicious, pungent, smoky quality unlike any other pepper; many people find its flavor and aroma irresistible in sauces and salsas. Don't want the heat but like the Habanero? Make sure you check out our Habanero Habanada in the sweet peppers below! But don’t let the color fool you; these are not candy, but rather flaming-hot fruit that carry a massive 300,000 Scoville units of heat! So beautiful! The chocolate-brown, lantern shaped fruit are about 2” long, and so ornamental! Hot pepper enthusiasts love the heat and flavor that these chocolate fruits are packed with, but be careful and use in moderation. Super hot pepper with a multitude of uses. The famously hot and pungent pepper takes its name from a river in Guyana. We like to think the name derives from locals fleeing to the river for relief, their mouths scorched by the incendiary pepper. Most often dried, Cayenne, powdered or flakes, serves as a multi-purpose spice. The South American pepper's 4-6" long, 1/2" thin fruits, slightly hotter than jalapenos, have a multitude of uses, whether fresh, canned or pickled; excellent steeped in oil or vinegar for flavorful condiments. A Mexican favorite that's four to five times hotter than jalapeño: distinctive, pungent flavor. Heat-lovers, here's another Mexican favorite used in a variety of dishes, from salsas to soups, with a distinctive, pungent flavor. Peppers are about 5" long that start out bright yellow and turn red as they mature. They make great pickled peppers. Sweet it is, Sweet Peppers! These are some of the best you can get. Some you'll have heard of before but some, maybe not! The world’s first “heat-less” habanero. Instead of heat, it delivers a blast of sweet tropical flavors. A true game-changer in the pepper world. ‘Habanada’ is the world’s first “heat-less” habanero. Instead of heat, it delivers a blast of sweet tropical flavors. Excellent seared, braised, roasted, or raw, ‘Habanada’ is a versatile culinary jewel. Can be used at the green stage, but ‘Habanada’ reaches the pinnacle of flavor and texture when it turns a beautiful orange hue. The standard heirloom bell pepper. HEIRLOOM. The standard bell pepper for many decades, this 1928 introduction is still the largest heirloom bell you can find. A perfect stuffing pepper-blocky 4" x 3 1/2", thick-walled, tender and flavorful. HEIRLOOM. An All-America Selections Bronze Medal winner for 1941 and still extremely popular. Even after more than 70 years, this is still extremely popular pepper. Large, pointed fruits measure 6-7" long and 1 1/2" across. The mild yellow peppers ultimately turn brilliant red. A favorite for pickling. An elongated lamuyo type that ripens green to red with medium-thick walls. It wouldn't be summer in Indiana without fresh tomatoes! Legendary heirloom, huge beefsteak consistently wins taste-tests. This huge heirloom beefsteak (up to 4 lb. ; average 2 1/2 lb.) consistently wins taste-tests. Developed in the 1930s by a gardener who planted the four biggest varieties he knew and crossed one with pollen from the other three. He did this for six seasons and created a variety that produced immense, tasty fruit. He sold the plants for $1 a piece and paid off his $6000 mortgage in 6 years. Sweet, tart, flavorful heirloom tomatoes originating in the Ozark Mountains. This 100-year-old heirloom favorite hailing from the Ozark Mountains of Arkansas produces rich flavorful tomatoes. Deep pink when ripe, the round 6-8 oz. fruits' artful balance of sweetness and tartness accounts for its standing as one of the very best heirloom varieties. Mama Mia! The new standard in home-grown paste tomatoes. These beauties are plum-shaped, incredibly meaty, and enormous-up to 5" long and 3" across. Skin peels away easily after par-boiling, which means less fuss, less mess and more delicious, thick, creamy sauce! Grape-like clusters of perfect mini roma tomatoes. Enormous clusters of perfect 3-4 oz. roma-type fruits are produced on these vigorous vines. Snip once and carry an entire harvest inside. Firm, rich flesh is ideal cooked or diced for salsas and chutneys. Raspberry-red skin is thin and blemish-free, guaranteeing that every dish looks as good as it tastes. Good things do come in small packages. Acorn-shaped Wisconsin heirloom: for paste, as a slicer, and in sauces. A multitalented heirloom paste tomato from Wisconsin well-suited for paste, or as a slicing tomato. Acorn-shaped, the very large 8-12 oz. fruits are deep red, thick-fleshed and nearly seedless. You are going to love this garlic. No "store garlic" here! Rich complex flavors with heat that builds from first to last bite. Thai Fire is a Turban garlic from Bangkok with rich complex flavor. Nut brown to royal purple colored bulb covers give way to cloves that gradually increase in heat intensity from first bite. Averages 7 cloves per bulb. Hardneck variety. Ajo Rojo is a beautiful and distinctive garlic with red/burgundy clove wrappers and good storage. Silky bulb wrappers. Vigorous root system and late harvest for incredibly rich flavor. Averages 11 cloves per bulb. Hardneck variety. One of the best for raw eating. Rich flavored Creole garlic with deeply colored purple clove wrappers. Averages 10 cloves per bulb. Hardneck variety. Enormous bulbs weigh up to 1 lb.! Has a milder, mellower flavor. Enormous bulbs that are up to 4" wide and 3" long! Delicious mild flavor. Averages 2 cloves per bulb. Originally from a small village in the Transylvanian mountains. This great garlic originated in a small village in the heart of the Transylvanian Mountains and was discovered in a Romanian Farmers Market in the mid-1990s. Stores well due to the tight, coarse tunics around its cloves. Averages 10 cloves per bulb. Softneck variety. A very late maturing variety that then keeps exceptionally long. Softneck variety that is medium in size with a short and round bulb. The skin is very tight, which is a little hard to work, but the tight, coarse tunics keep cloves fresh in storage for up to 8 months. Nice and mild flavor with medium heat. Averages 25 cloves per bulb. Onions, tomatoes, peppers... I'm thinking salsa! We love onions here at Christopher Farms! Once you try our varieties you'll never want to go back the buying sacks of onions from the store. Size Potential: Up to 6"
It is the sweetest variety available. Contain a higher concentration of quecetins, an antioxidant compound that helps delay or slow damage to the cells and tissue of the body. Also known as Sierra Blanca. Only white onion ever to win the coveted All-American Selection. Walla Walla has been a favorite for years for its flavor and is the pride of Washington State! They were brought to Walla Walla, Washington by a French soldier brought from Corsica, Italy over a century ago. Sweet as the Vidalia or 1015Y Texas Super Sweet, so eat them quickly. Brought to the U.S. from the British Isles in 1887 by David Murray, gardener for the Marquis of Ailsa, this heirloom onion is by far the largest onion you can grow in a short growing season. Ailsa Craig does not store well, so enjoy it soon after purchase. Also known as the Kelsae Sweet Giant. Not only is it brilliantly colored throughout, but it will store up to 8 months! Red Zeppelin has the best storage potential out of all our long day sweet varieties. 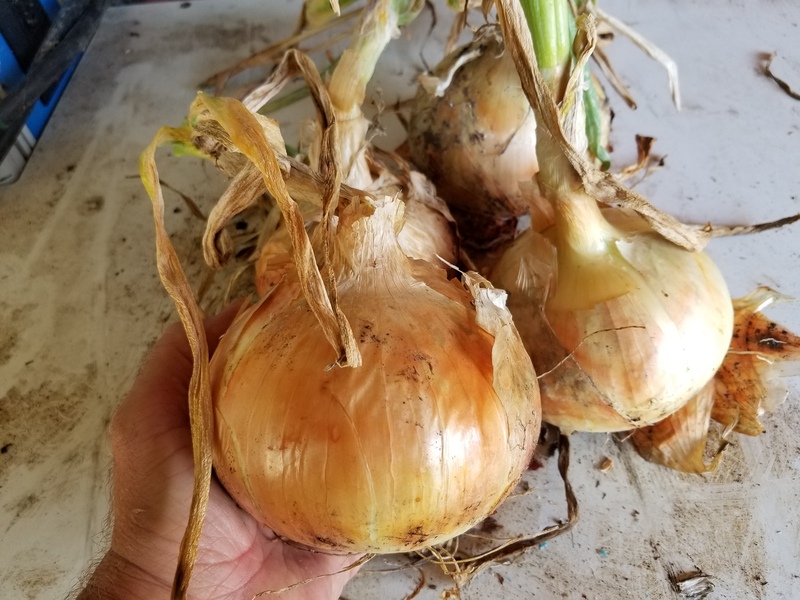 This hybrid onion plant produces large, round, richly dark red to purple onions with a slightly pungent flavor that will add attractive color to any dish. When left to mature, this onion will have intense purplish rings throughout. The Red Zeppelin offers a balanced combination of flavor and shelf life. Sweetest tasting storage onion available! Best storage onion for Northeast and Northwest. Normally it will make a nice round, hard 3" onion. Ideal for cooking since it maintains a nice flavor. It will stay firm and flavorful after most other varieties have sprouted. A fall/winter type cabbage that stores very well. Introduced in 1924, it is an excellent variety that is becoming rare. Heads are large, 6–10 lbs., and flat, making it easier to cut for processing. Perfect for making sauerkraut. Some gardeners say Stonehead may be the perfect cabbage. The easy-to-grow plants produce tightly packed, short-cored heads that average 4-6 lbs., the perfect size for chopping into slaws, sauerkraut or cooking into other recipes. They're flavorful too! Long pods are sweet and tender— perfect for salads and stir-fries. Tender pods cook up sweet and crunchy. Freezes well, with no loss of color or flavor. Enjoy Blue Wind's sweet, mild taste and tender texture earlier than any other broccoli from the market. Even the most picky veggie eaters will agree that Gurney's Blue Ribbon Hybrid broccoli is delicious! This fantastic variety took the blue ribbon in Gurney's 2014 trials for its large, healthy plants that produce giant green-blue heads. Early harvest and sweet, non-bitter flavor with buttery-tender texture are sure to win you over from the season's start to finish. Flavorful Crops in Fall or Spring! One of the easiest cauliflowers to grow. Snow-white, 2-lb. heads are 7-8 in. across and very flavorful. For lower-carb pasta! Pasta-like flesh looks like the real thing; great topped with cheese or spaghetti sauce. Cylindrical 2- to 3-lb. fruits. Full-flavored, premium-quality tapered emerald pods.